How do you punish your teenage son when he happened to be one of his “other” selves when he broke the rules, and now that personality is gone? How do you introduce him to people when his personality that day won’t let you call him by your son’s name? How do you relax when, on any given day, you have to live with someone who looks almost identical to your child, but who you don’t know very well yet? — 1,114 words. Our lead story this edition is a moving account by Judy Wilson, a mother of two interesting children. Earlier we ran a piece about one of them (please go to the True North Perspective archives and Google Judy Wilson). Today Judy writes about her teenage son who has Dissociative Identity Disorder better known by its former name, Multiple Personality Disorder. Judy’s children are lucky to have a mother like her. Judy writes of her dilemma with the power that comes with understatement. The problem and the profound empathy with which she deals with her children is must read for all who would expand their knowledge and understanding of the human condition. — 232 words. Because Prime Minister Harper doesn’t take well to advice from the news media, especially a member of the loathed Parliamentary Press Gallery, I turn to True North Perspective to pass on my proposal for reforming the Senate. — 541 words. False beliefs are everywhere. Eighteen percent of Americans think the sun revolves around the earth, one poll has found. 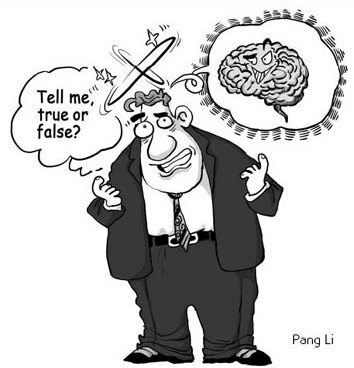 This effort to dispel misinformation may be more difficult than it seems, thanks to the quirky way in which our brains store memories - and mislead us along the way. — 756 words. In 2005, following a demand by the Canadian Trucking Alliance, the Quebec and Ontario governments commissioned a number of studies on speed limiters for all heavy trucks travelling in Canada at no more than 105 km/h. Last Friday, Transport Canada released a report on the impacts of such a regulation. — 156 words. This weekend, we celebrate our great American pastime: messy celebrity divorces. There’s the Christie Brinkley/Peter Cook fireworks on Long Island and the Madonna/Guy Ritchie/A-Rod Roman candle in New York. — 790 words. NEW YORK — Canadian Maher Arar, whose "rendition" to Syria is widely viewed as an egregious example of mistaken identity, has again been denied the right to appear in court, and Congressional efforts to rein in the George W. Bush administration's widespread use of national security as a defence appear to be foundering. — 1,238 words. CARACAS, Venezuela — Venezuelan President Hugo Chavez will visit Russia this month to discuss purchasing tanks and other military equipment, which he says is needed to stave off the threat of a U.S. attack. — 155 words. LOS ANGELES (Reuters) — The smaller of Hollywood's two performers unions ratified a new prime-time TV contract on Tuesday, undermining a last-ditch bid by the larger, more militant Screen Actors Guild to secure a richer deal. — 836 words. The long-running showdown over the proposed US-Iraq treaty, aimed at legitimizing the American occupation of Iraq, is coming to a head, and it doesn't look good for the United States. Prime Minister Nouri al-Maliki tossed a bombshell Tuesday, July 8. In a news conference about the still-secret US-Iraqi talks, which began in March, Maliki for the first time said that the chances of securing the pact are just about nil, and instead he said Iraq will seek a limited, ad hoc renewal of the US authority to remain in Iraq, rather than a broad-based accord. — 631 words. GLate last year, Congress agreed to a request from President Bush to fund a major escalation of covert operations against Iran, according to current and former military, intelligence, and congressional sources. These operations, for which the President sought up to four hundred million dollars, were described in a Presidential Finding signed by Bush, and are designed to destabilize the country’s religious leadership. 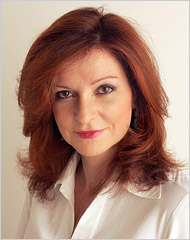 The covert activities involve support of the minority Ahwazi Arab and Baluchi groups and other dissident organizations. They also include gathering intelligence about Iran’s suspected nuclear-weapons program. Clandestine operations against Iran are not new. — 6,157 words. "As these files remind us, many charges of war crimes in Iraq have not seen the light of day," said Michael Pheneger, a retired Army intelligence colonel who is also a board member of the American Civil Liberties Union. "There are many discoveries here that should bring pause to any American who cares about this country and hopes to restore the United States' respected role in the world. It is time to bring the facts about this war into the sunlight and end practices that go against our laws and national values." What do the initials OMB stand for? SAN FRANCISCO — U.S. journalist Zoriah Miller says he was censored by the U.S. military in the Iraqi city of Fallujah after photographing Marines who died in a suicide bombing. — 1,393 words. One week ago in the center of Makhachkala, assailants gunned down Colonel Mogamed-Arip Aliyev, head of the local branch of the Interior Ministry in the city of Buinaksk. There had been several previous attempts on his life. Once, his attackers placed a bucket filled with explosives in Aliyev's home, but rain later dampened the detonator, foiling their plans. Aliyev's children found the bucket with explosives while playing the next day. — 652 words. TORONTO — There was no reason to "bring down the hammer" on seven aboriginals who were incarcerated and fined after protesting against mining projects in their communities, the Ontario Court of Appeal ruled Monday in calling the six-month sentences "too harsh. — 628 words. OAXACA and CHICAGO — On April 30, in the small village of Santo Domingo Ixcatlan, in Oaxaca, Mexico, a group of armed men from the paramilitary group the "White Guards" pulled over the car of carpenter Gustavo Castaneda Hernandez, a villager and vocal opponent of the sale of Santo Domingo's communal land. The group, led by Freddy Eucario Morales Arias, the ex—mayor of Santo Domingo, rapidly blocked off the entrance and exit to the road with pickup trucks. The men began beating Hernandez, still trapped in his vehicle. They then set the car on fire. Hernandez was burned alive. — 1,607 words. HAVANA (Reuters) — Cuba is investing in sugar cutting combines, trucks and other equipment and retooling mills in preparation for a big jump in output in 2008-2009, the official media said Wednesday. — 336 words. HAVANA (Reuters) — New Cuban President Raul Castro's promise to improve daily life is running up against soaring fuel and food prices for the import-dependent country and belt tightening is in order, the official media said on Tuesday. — 633 words. John McCain would kick Russia out of the Group of Eight economic powers, but this is no time to think small. The G8 leaders themselves should declare surrender and disband their high-profile huddle on the state of the world. Think of it as global shock therapy. — 755 words. 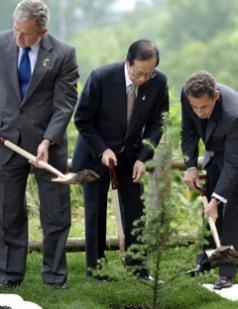 Stunning hypocrisy — At the G8 summit in Tokyo, President George W. Bush, Japanese Prime Minister Yasuo Fukuda, French President Nicolas Sarkozy and Russian President Dmitry Medvedev plant a tree. Despite grandiose claims of a groundbreaking climate change deal, the leaders have specified no details on how their goals will be achieved, according to The Independent UK. (Photo: AFP / Getty Images) — 449 words. As the death toll after the June 27 run-off poll climbed to 20 recorded cases, the Movement for Democratic Change (MDC) said it would prefer a respected figure such as former United Nations (UN) secretary-general Kofi Annan or businessman Cyril Ramaphosa to take charge of mediation to end the Zimbabwe crisis. — 298 words. In 1996, a little-known lieutenant general told a few journalists the last thing I expected to hear from a Russian military leader: "The armed forces should be given only concrete military goals, not political goals. Troops should be withdrawn from the battlefield immediately after the completion of the military objective." — 747 words. The U.S. already has high rates of volunteerism, but that's apparently not good enough for our presidential candidates. There's a weird irony at work when Sen. Barack Obama, the black presidential candidate who will allegedly scrub the stain of racism from the nation, vows to run afoul of the constitutional amendment that abolished slavery. — 848 words. The production of biofuels has driven up food prices 75 per cent, according to an unpublished World Bank report obtained by The Guardian. — 353 words. Neighbours woke to the sound of gunfire, then a car horn blaring continuously. Habibullah Jan lay slumped against the steering wheel of his Toyota Corolla, bullet holes peppering the modern white sedan. The killing of the 47-year-old parliamentarian on Friday night, July 4, has deepened the sense of alarm in Kandahar city, as the provincial capital lost another of its local protectors. The chain-smoking tribal elder controlled the city's western suburb, Senjaray, with a private militia and a talent for deal-making. — 942 words. If Kim Jong Il plays charades, his hand gestures might look just like George Bush's, a new study suggests. It seems that, regardless of the sentence structure of their native tongue, non-verbal communication is the same across the globe. — 338 words. Senator McCain was in Colombia last week touting his support for the trade agreement that the Bush administration had negotiated with the country. He also touted his support for NAFTA, contrasting both positions with Senator Obama's opposition to the two pacts. McCain had an important ally in his campaign. The media decided to embellish McCain's case by touting his support for "free trade," as opposed to the specific deals in question. This is a very important difference and it reflects deeply held biases in the media. —763 words. Pacific nations threatened with disappearing beneath the waves as sea levels rise have been given a partial reprieve – for a few decades at least. But Europe and North America could be at much greater risk of floods than previously appreciated. So claims the first systematic analysis of what will happen to the water from melting Greenland ice. — 481 words. I am penning this Quest on the deck of a cottage that overlooks a beautiful lake in the hills north of Ottawa. The first thing I do every morning is go down to the dock and dive into the cool and, yes, pristine waters. The last thing I do before retiring to my bed is to watch from that same dock the moon rise over the trees on the other shore. — 686 words. OMB stands for Ontario Municipal Board, which is an independent and impartial adjudicative tribunal that listens to the appeals and concerns of people, public bodies or corporations who object to the decisions of local or regional councils, committees of adjustment, land division committees or the Minister of Municipal Affairs and Housing.